Plaza Premium Lounge, an airport services company headquartered in Hong Kong, has opened a new lounge at Heathrow Terminal 5. The new lounge, which is located on Level 2 of the departures area next to gate A7, will be welcome news for those flying economy, or without the required tier status to access BA’s lounges in T5. The new lounge has a location overlooking the runway, and is open to all travellers for payment of a fee starting from £40 for two hours. The 465m2 lounge is Plaza Premium’s sixth at Heathrow, and offers hot and cold food, a fully serviced bar, high speed Wi-fi, shower facilities and newspapers and magazines. The opening hours are 05:00 – 22:00 daily. Plaza Premium also intends to open a, 83-bedroom Aerotel hotel in Terminal 3 next year. The group manages over 150 lounges worldwide in 37 locations. https://gtm.uk.com/wp-content/uploads/2017/11/Plaza-Premium-thumbnail.jpg 516 916 Paul https://gtm.uk.com/wp-content/uploads/2015/05/logo_trans.png Paul2017-11-09 14:00:302017-11-09 14:00:30Plaza Premium Opens Heathrow T5 Lounge. Terminal 2 | The Queen’s Building Opens Today! Heathrow Airport’s brand new Terminal 2 opens today, Wednesday 4th June 2014, with Her Majesty the Queen officially opening the building on Monday 23rd June 2014. The first flight, a United Airlines’ flight from Chicago, arrived at Terminal 2 this morning shortly before 0600 BST. 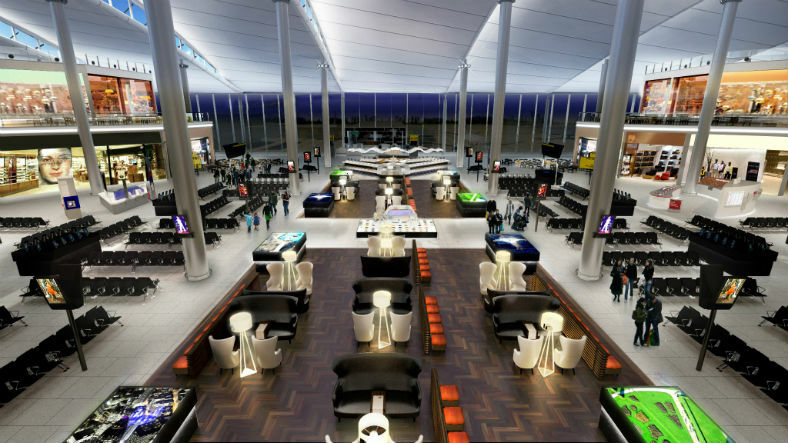 Officially known as the Queen’s Building, Terminal 2 will become home to all Star Alliance carriers, plus Aer Lingus, Germanwings & Virgin Atlantic Little Red. It is important to note that there will be a phased approach, with all of the aforementioned airlines moving into T2 over the course of the next four months. United Airlines is the first airline to move in today, followed by Air Canada on 18th June, with Air New Zealand, Asiana, SAA & TAP Air Portugal being the last carriers to move across from Terminal 1 on 22nd October 2014. Enjoy the new Terminal 2, I (PB) was fortunate enough to go on a tour of the building earlier in the year, and it will be a fantastic new terminal from which to fly into and out of. If you travel through the new terminal in the nest few weeks, do let us know what you think. https://gtm.uk.com/wp-content/uploads/2015/05/logo_trans.png 0 0 Paul https://gtm.uk.com/wp-content/uploads/2015/05/logo_trans.png Paul2014-06-04 08:20:222014-06-04 08:20:22Terminal 2 | The Queen's Building Opens Today! Belfast Airport – delays during G8 Summit. Belfast International Airport has issued a warning to passengers to leave extra time to catch their flight during the G8 Summit, which is being held in Northern Ireland on June 17 and 18.
the airport and in the airport terminal itself,” said spokeswoman Deborah Harris. “Passengers leaving Belfast International, and indeed arriving, will see the increased security levels in the terminal as well as on the roads, but they should not be alarmed. Belfast International will be the airport used by all the official G8 delegations, but George Best Belfast City Airport is also expected to be very busy. City Airport officials expect the airport’s Heathrow services to be especially heavily booked with back-up teams to the official delegations. https://gtm.uk.com/wp-content/uploads/2015/05/logo_trans.png 0 0 Paul https://gtm.uk.com/wp-content/uploads/2015/05/logo_trans.png Paul2013-06-05 13:00:352013-06-05 13:00:35Belfast Airport - delays during G8 Summit.